(Frigate Bay, St. Kitts)—Caribbean Heads of Special Branch convened a meeting at the St. Kitts Marriott Resort in Frigate Bay from June 4-6 to tackle the problem of increasing crime and violence in the region. The theme of the conference is “Promoting stability, security, democracy and economic development through intelligence-led policing to reduce the upsurge of youth gangs, drugs, firearms and ammunition”. In attendance at the opening ceremony of the conference was Pastor Leroy Benjamin , Chaplain of the Royal St. Christopher and Nevis Police Force, The Honourable Dwyer Astaphan, Minister of National Security, Mrs. Astona Browne, Permanent Secretary in the Ministry of National Security, Mr. Starret Greene, Director of the O.A.S., Mr. Joseph Liburd, Assistant Commissioner of Police, members of the Officers Corps of the Royal St. Christopher and Nevis Police Force, Mr. Hester Rawlins, Fire Chief and visiting delegates from the Region. Inspector Cromwell Henry, Public Relations Officer for the St. Kitts and Nevis Police Force, chaired the proceedings and gave the opening remarks. “Indeed this theme is particularly fitting as the world grapples with the high cost of food and energy which are all factors that influence crime and violence. The Caribbean is not immune from the impact of global events as we have seen over the last five years increasing youth gang activity, illegal use of firearms, the trafficking of illegal drugs and the resulting impact on our respective economies. The Police Force has a critical role in ensuring that the economic viability of our economies is sustained. Forums such as this provide the mechanism whereby we can engage each other, share information, develop linkages that will help us to achieve our ultimate goal as outlined in the theme,” Inspector Henry said. Superintendent M. Dolphin gave the welcoming remarks and highlighted some of what Inspector Henry said. Joseph Liburd, Assistant Commissioner of Police, deputized for Commissioner of the St. Kitts and Nevis Police Force, Austin Williams, who was off island. Mr. Liburd spoke about the crucial role that intelligence led policing played today. “Intelligence led policing is really the answer to the problem of rising crime that is affecting us in our islands and various countries. This is what Sir Robert Peale envisaged very early in modern policing when he said, ‘the Police are the public and the public is the Police.’ At that time he expected us to get intelligence from the public in combating crimes. “Sadly, we have deviated from this concept and to our own detriment and that of the communities we have seen rising crimes, low detection rates, reactive styles of policing and an adverse relationship between the public and the Police. Intelligence led policing is a model that has re-emerged in recent years and has built around it risk assessment and risk management. “It is a strategic future oriented and targeted approach to crime control, focusing upon identification, analysis and management of persisting and developing problems of crime,” Assistant Commissioner Liburd said. 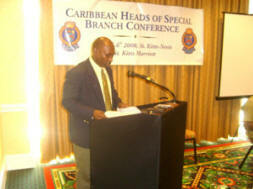 The Honourable Dwyer Astaphan, Minister of National Security, gave the feature address. He spoke about addressing the causes of crime and the importance of parenting in the fight against crime. The murder rate in the English Speaking Caribbean is higher than the murder rate in any other part of the world that has the same macro-economic situation, he said. Minister Astaphan said that the problem of crime is compounded by the fact that the sugar industry in St. Kitts was closed and that the cane fields are now used for the production of marijuana. He said that it might be surprising to know that many gangs operate in the Federation of St. Kitts and Nevis that are well organized. He said these gangs sell drugs, are involved in prostitution, extortion and contract to kill. He said that Anger Management and Problem Solving Skills should be a part of the school curriculum. He said that there are future plans to introduce CCTV cameras to track criminals and the introduction of a forensic lab in the North Eastern Caribbean to help with the solving of crime because getting forensic help from Jamaica, Barbados and elsewhere takes up enormous time because those countries too are grappling with high crime. “The application of policing must be stepped up and it must be consistent,” Minister Astaphan said. “We must be aggressive and assertive,” he said. The conference will have reports from the visiting delegates with respect to crime in their respective countries.